Three square tiles can be used to form a right-angled triangle by placing them corner to corner as shown below. The areas of some square tiles given below. 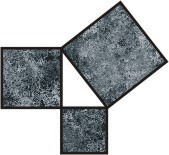 Which three tiles can be placed corner to corner, in the manner shown above, to form a right-angled triangle? It is possible to do it with any three tiles. Choose the correct option that completes the sentence below. Both students are equally good, __________.